After more than 50 operations to repair his badly mangled leg and advice to never again race a bike, Ian Hutchinson is back as a winner at the Isle of Man TT, taking the first Supersport race win this evening on the Team Traction Control Yamaha. Hutchinson had been slated to race with MV Agusta in the 600cc class but the team pulled out as they felt they needed more time, and Keith Flint’s squad stepped in with a bike for Hutchinson right at the last minute and he has rewarded the Prodigy front-man with victory. 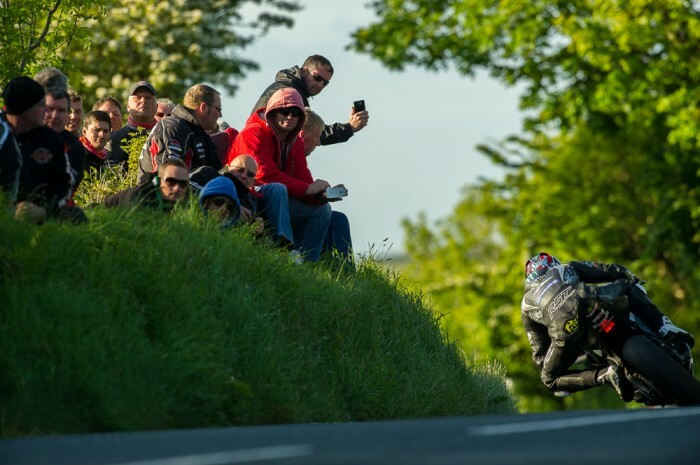 Like the Superbike TT yesterday, it was a two-horse race for the final two laps with Hutchinson fending off a charge from Valvoline Padgett’s rider Bruce Anstey who crossed the line a little over seven seconds behind the Bingley Man with Gary Johnson third. Johnson picked himself up from a crash at Guthrie’s in yesterday’s Superbike outing to really challenge Hutchinson and Anstey. He pulled out a two second lead on lap at Glen Helen over Dean Harrison while Anstey shook himself up by clipping a kerb at the top of Bray Hill. At Ramsey, Johnson was a further 0.364s in front but it was Hutchinson who had claimed second place from Harrison, who led on the road, with Anstey up to fourth ahead of James Hillier on the Quattro Kawasaki. By the time the reached the Bungalow, though, Hutchinson had the hammer down and was just 0.280s behind Johnson and took the lead at Cronk-ny-Mona to finish lap one with a three-quarters of a second lead at the grandstand and a 126.400mph opening lap. It took a lap for Anstey to recover his composure and he was up to second ahead of Johnson at Glen Helen on lap two, 2.171s down with Johnson third. Lee Johnston had moved into fourth place with Guy Martin fifth as Harrison retired at Crosby and Michel Dunlop also retired at Kirk Michael. Hutchinson was 3.458s ahead of Anstey at Ramsey but Johnson had cut the gap to 0.270 while Martin had passed Johnston for fourth place at Ballaugh. At the Bungalow, it was Johnson back to second place but by the time they came into the pits, Anstey had re-gained runner-up spot and trailed Hutchinson by 2.494s. Martin’s challenge was over in the pits as he got a 30s time penalty for speeding and Johnston leapfrogged him for fourth and the pair would remain in those spots until the end, alhough Martin closed a 16s gap to nine seconds by the chequered flag. Hutchinson slowly increased his lead on lap three to 7.369 at Ballaugh but Anstey had other ideas and pulled it back to six at the grandtand, so set up a last-lap cracker as the gap was down to 5.148 at Glen Helen. Hutchy, however, was having none of it and gradually pulled away and had a 9.051s lead at the Bungalow before knocking it off to win by 7.723s and a final lap of 127.571. Anstey and Johnson joined him on the podium with Johnston and Martin completing the top ten. Hiller claimed sixth place with John McGuinness in seventh and team-mate Conor Cummins eighth. Dan Kneen and Michael Rutter rounded out the top ten with David Johnson, Ivan Lintin, Cameron Donald, Dan Cooper and Jamie Hamilton making up the top 15.